Public Speaking Training Material is designed to develop the presentation skills of employees to help get over the fear of speaking in public, and shine under pressure. Confidently train your staff how to plan and prepare for presentations, how to understand the audience, overcoming nervousness and more! 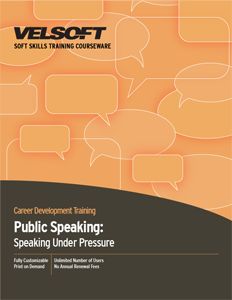 Seeing is Believing This sample manual to teach Public Speaking: Speaking Under Pressure is in MS Word format. If you want to improve your public speaking skills and gain a persuasive edge when making a presentation, fielding tough questions, or presenting complex information, look no further than Velsoft's two-day Speaking Under Pressure Training Materials! Designed specifically for students who are relatively new at public speaking, or who want some training on how to think on their feet and learn techniques to give them an edge no matter how little warning they've had, Speaking Under Pressure will teach students how to develop effective public speaking skills. With Velsoft's training materials, trainers gain access to easily customized, content-rich courseware. Full of activities to teach public speaking skills, pre- and post-course assessments, an instructor's guide, student manual and more, trainers can even combine their training material with eLearning. With this blended learning solution, students are free to learn at their own pace no matter where they are using the latest developments in distance learning technology available. Now they'll never have a reason to let a question or tough audience get the better of them-teach them how to speak under pressure and improve their public speaking skills today!